When Should Babies Begin to Feed Themselves? July 10, 2015|Posted in: Happy, Healthy, Smart Kids! Most babies can begin learning to feed themselves by around 9 months old. Their fine motor skills are developing and at this age they can begin to pick up small pieces of soft food between their forefinger and thumb. They may start by using all of their fingers and grabbing a handful of food. They often miss what they’re trying to pick up or drop it halfway to their mouths. Don’t let that frustrate you. As long as baby isn’t frustrated they are learning, not just learning to feed themselves but learning to be independent and do things for themselves. 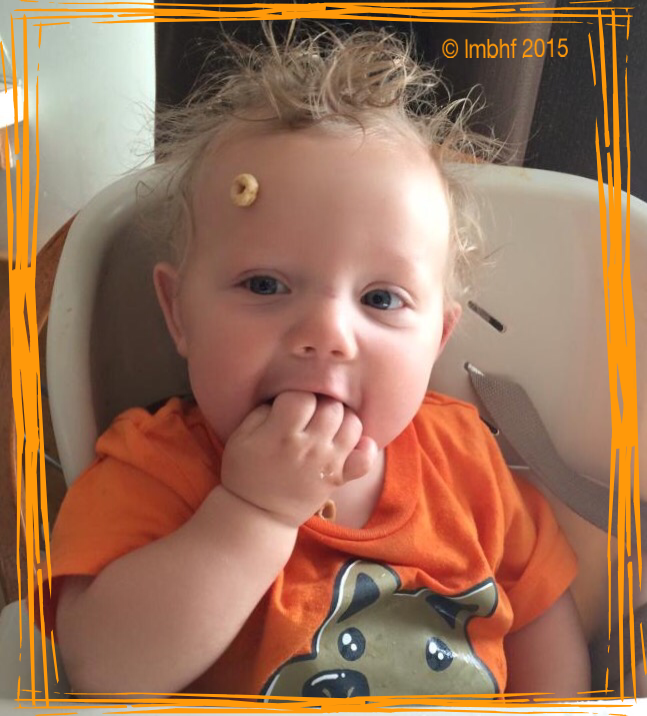 This picture is of G4 learning to master the art of eating Cheerios! At first you’ll need to help make sure baby gets enough food and just let them self feed for the practice. By about 12 months old most babies are able to feed themselves a complete meal. Of course they’re not able to use spoons and forks efficiently. They’ll just use their hands for most things. You’ll still need to help them with things like soups, puddings and ice cream for quite awhile. I like to give baby a spoon made especially for little ones. They may not actually get any food into their mouths with it, but they’ll practice and begin to learn so that one day they’ll be able to use utensils on their own too. Make sure that the food you serve baby is soft. Give baby more than you think they will eat. Remember a lot of it will never make it to baby’s mouth. Never feed baby hard foods that they could choke on. Cut the food into small bite size pieces. Never force a baby to eat when they don’t want to. Offer good nutritious foods and babies will eat what they need. Don’t worry if baby gets messy, that’s what wash cloths are for! A messy floor isn’t the end of the world and cleaning it up won’t take long! « Don’t Force Children to Eat!